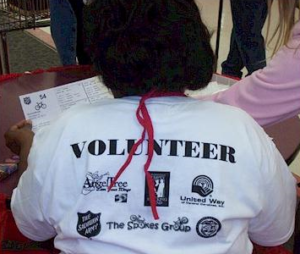 The Spokes Group realizes that many people have given generously to deserving local charities of their choice….and should feel very proud of their contributions. However, there are still many in our local community that need your help. Over 4,000 families will be coming to the Salvation Army Christmas Bureau this year, and they will all be hoping to carry a bicycle home for one of their children. We do have a “stretch goal” this year to raise enough money for the growing needs in our communiy. As you know, every dollar of all donations goes to purchasing bicycles, with zero administration expense. The Spokes Group pays for all administration expenses on a personal basis. We have been able to get a quality bike, helmet, and assembly for $75.00. Upon request, we can mail these cards direct, or send you cards to mail. 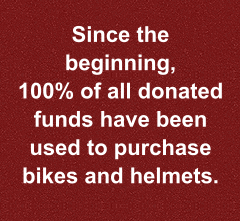 These cards have become very popular to the extent that some donors have purchased as many as ten bicycles, and requested ten cards to be mailed.